Beautiful russet oak leaves are set off by the deep forest behind them. A ray of sunlight lights up the sprig of leaves and acorns still clinging to the branch. People sometimes ask how I decide what color to use for the background. In this case, I used a deep blue. Blue is the complement, or opposite color on the color wheel, to orange. Since this russet color is a variation of orange, deep blue is its opposite. When placed next to each other, complementary colors look brighter than they otherwise would appear. This helps to "light up" the leaves showing off the beauty of their color and helping to create the appearance of sunlight upon them. The original painting is sold. 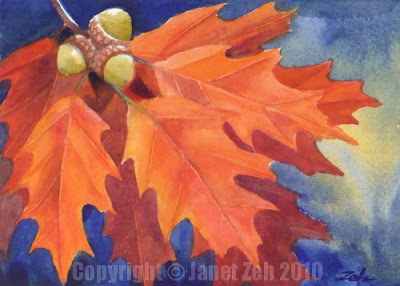 You can find more of my autumn leaf paintings in my Etsy shop. Thanks for stopping by!